They are workers relocating from Southern California, following employers like Toyota and Jacobs Engineering. They are college graduates moving from the Midwest to start careers in what is, reportedly, the country’s best city in which to find work. They are highly skilled immigrants from India capitalizing on a demand for tech workers. They are people from the East Coast who are simply tired of schlepping through slush every winter. They keep coming to Dallas, waves and waves of them, all looking for places to live. Looking and buying and boosting prices. 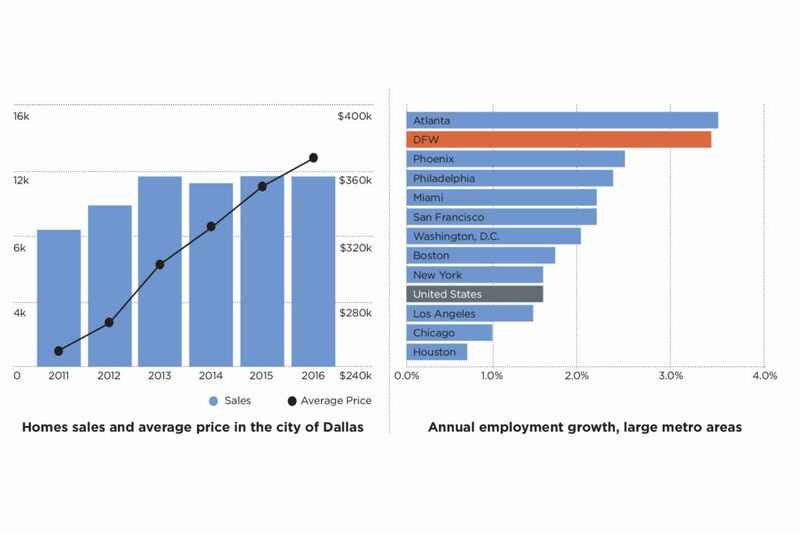 Almost 800,000 people have come to the Dallas area since 2010, more people than live in Washington, D.C. Almost 86,000 moved here last year alone. Add the deaths and births, and last year the Dallas area’s population increased by 143,000. That made Dallas the No. 1 place in the nation for population growth in 2016. That population growth continued to drive housing prices past the record-high levels that were hit in 2014 and 2015 and again in 2016. Since 2012, the median price on a single-family house in the Dallas area has shot up more than 50 percent. So far this year, the median price has gone up another 12.32 percent. Up. They’re going up. You heard it right here. Again. This very magazine—which declared the year 2015 to be “The Hottest Dallas Real Estate Market Ever!” then, last year, declared 2016 to be “The Hottest Dallas Real Estate Market Ever! (Still! )”—is telling you that 2017 will be even better than 2016—for sellers, anyway. Prices have continued to climb by double digits in parts of Dallas. The Park Cities and DeSoto posted 22 percent price gains this year. Sales of homes offered for more than $1 million are particularly robust. And CoreLogic has reported that Dallas was third in the nation in sales gains earlier this year, trailing only Seattle and Portland. But keep looking at the data, and a curious picture emerges. The number of houses changing hands is only slightly up overall from 2016. Plus, sales were actually down in the early part of this year in several previously hot places, including Southlake and East Dallas. In once-white-hot North Oak Cliff, prices declined 3 percent through April. Fair enough. This year is likely to set more records for new construction, total sales, and price increases. But there are signs that the market is starting to cool off. The pace of construction is picking up and newly built homes are getting cheaper. One of the main factors driving prices both in Dallas and nationally has been a lack of available houses for sale. Homeowners who made it through the Great Recession with their own roofs still over their heads tended to stay put. Builders, constrained by tight lending, slowed construction. So around 2012, when new buyers started showing up in Dallas, the housing supply was low. Supply, demand, you get it. Prices went up. Today, though, after eight years of economic expansion, more homeowners are listing their properties as they move up or move on. And builders have started to accelerate their work, too. That’s put more supply on the market, which could soften prices. Dallas-Fort Worth actually leads the nation in the number of new houses being built, beating out Houston this year for that distinction. Metrostudy, a real estate research and consulting firm, says that local builders completed construction on just under 29,000 houses from the first quarter of 2016 to the first quarter of this year. That’s almost 17 percent more houses than they’d finished in the 12 months before that. To handle all those new workers for Toyota and JPMorgan Chase and Liberty Mutual and Charles Schwab and TD Ameritrade and State Farm and Raytheon and on and on, houses are being framed up at Legacy West in Plano and Phillips Creek Ranch in Frisco and Light Farms in Celina and at Cross F Ranch in McKinney, where 6,000 single-family homes and 7,000 multifamily units will be built on 2,100 acres of now vacant land. In central Dallas, where vacant lots are less available, high-rise living is newly chic, and well-appointed apartments have opened all around the Knox and Henderson neighborhoods. Plus, developers like PSW Real Estate are pushing developments with just a handful of new or newly remodeled houses. Those include 5300 Glencoe Park and Emerald Point near Casa Linda, both of which offer “compact homes that live big” and range from under $400,000 to more than $700,000. As all those new houses have come to market, their prices have come down. A little. The median price of all the new houses on the Dallas market declined in the early part of this year, down $7,000, to $343,000. Some houses are sitting on the market longer. That’s also the case well beyond central Dallas. Suburbs that have the most existing sub-$200,000 houses—Richardson, Mesquite, Garland, and The Colony among them—have the fewest properties for sale. Meanwhile, builders—stretched thin by higher regulatory, land, and labor costs—have largely shunned projects where houses won’t command more than $300,000. Maybe some of the people doing the actual building are finding $300,000 and up to be a newly affordable price point. Wages for construction workers in Texas have gone up nearly 22 percent since 2012, 10 percent higher than the national average, and 20 percent higher than overall wages in Texas. 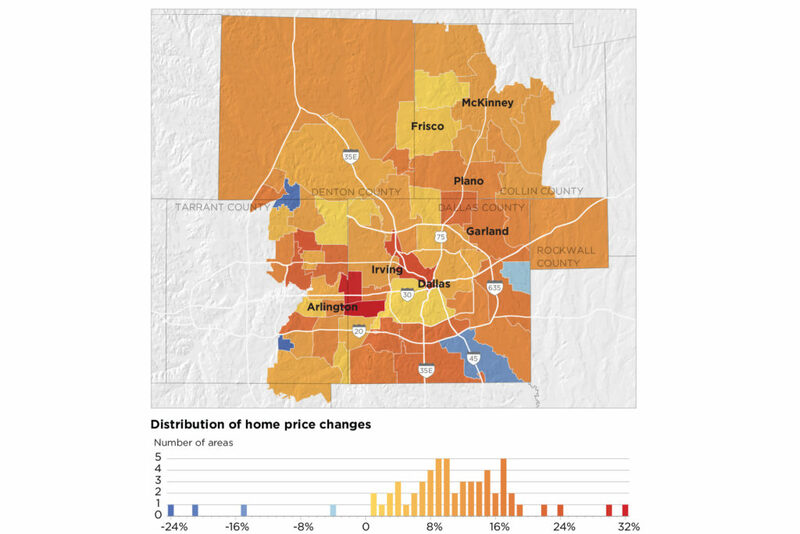 Since Dallas-Fort Worth median incomes have only risen 5.7 percent as median home prices have spiked more than 60 percent, some are worried that buyers will soon be forced to balk at further price increases. Anecdotally, some real estate agents say buyers have already started to push back against sellers, leading to longer time on the market for available properties. Take homes in the 75214 ZIP code, which is east of Central Expressway and north of Mockingbird Lane, as one example. As of this spring, there were 10 percent more houses on the market in that area than there were at the same time a year ago. That includes all categories of houses above $300,000, but the supply is particularly concentrated in more expensive homes. While the increased supply is a nice change for buyers, for sellers it’s not yet working out. This spring, sales were down 27 percent on the year for the whole area, across all prices. Supply was up. Demand was down. And yet, that’s the scenario playing out in any number of neighborhoods and suburban cities across the area. And the number of days that properties sit on the market has increased as a result in selected spots. In Southlake, days on the market this past spring were up 17 percent over 2016. In Plano, the increase was 9 percent. In Coppell, it was 4 percent. Still, it should be noted, prices were up in all of those communities, too. Of course, any number of other factors could throw off that balance. Higher interest rates or a higher level of political volatility in Washington could weigh prices down faster than expected. Or, another big corporate relocation announcement could push prices up to create another hottest market ever. Either way, while it seems closer, this market’s peak is not yet in clear sight.